"Fair QSLer" Award is available for any amateur or SWL worldwide. 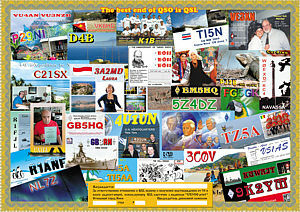 It is a full-color certificate (8x11 inches) and will be issued for contacts with, or listening to stations who sent a QSL card bearing the "UX5UO print" logo. There are no band/time/mode restrictions. Each unique callsign counts 1 point. Possession of the cards is required. To obtain the Award you require at least 50 points. Current list of stations using "UX5UO print" logo can be seen here. UU9JT, UA1ZJW, UT2UB, UR9MB, UT4ZO, UU5JWG, PA3DZN, UN7FW, UY9IF, UN7IG, UR5ASM, UT5MB, UA1TET, UA6-108-2064, UA9CES, UR5RH, R0DAT, UT7UW, UT5HP, UT5EFV, RX9WN, RA3ANL, UR3MP, UA4HUR, UR5FEO, UA9CUA, UA3GDJ, UT3UZ, UA3QRE, EZ8CW, UR3CDA, UT4CF, UY2UF, UR6MY, UR5CQS, RX1AB, UA9UDX, UA4FOT, U5NM, UR4RZA, JA8DGO, US1MM, UT1MV, RA3RGQ, UA4WNH, EX2A, RW0LIA, UX5UU, RN6MD, DL7GDF, UR8RF, UT0CK, EY8MM, EY8CQ, DH2RTW, US0NX, DJ9BK, ON4CLV, JF0VCD, UN7EX, US7IB, UT4UWL, U5EX, ON6NR, UT2IV, UR5XDB, U5MZ, UY7IO, UR5VNO, US0MS, G4IRN, UR7UP, UR4QMZ, UR5ZIB, US5UO, ER1DA, M0UNF, UA3XGM, RK6BH, 4Z5MO, US-U-19O, UA9OGF, UT4XU, UR9MY, UA1OM, G3ZQQ, G4ZIB, 4Z5MU, US-P-349, US0YA, UT1XX, US3INU, UX2IQ, UT7QF, UT2IV, U5MZ, UT7GX, HA8KW, DE7RAO, HA8FW, UT7UR, VU3DJQ, UA9CGL, OK1JNL, UR4RXJ, DL7BA, US5EOI, UU2JA, UR7UT, UT7LK, PA3FYG, US5EC, US3QQ, DL2LUX, VE7HL, UN7AM, US-P-39, UX1CW, W3ACO, UR5LF, OK1WCF, UR5LCZ, US3LX, UR6QS, UY5YA, UT2QQ, UT5UCM, VE3XN, N4MM, M0XLT, UY5LQ, RU9HM, UT3UW, EW8MK, W8MJF, DL1DTL, PA2GWA, PB0AMU, DL2DXA, ON6QP, UT3MI, UR5MA, UR0MM, EW8OW, UR5WJV, 4Z5TT, DE1KKG, G3LUW, UT1AW, RA0AR, UT8LG, VU2UR, WA8IQF, K0ABC, UT7XU, UX5PC, UR4CYT, UT5HTT, RW4HM, KD8ILL, JA8LRG, VK6ANC, UT4NY, G0THY, VE3OIJ, RX9CDQ, OH2OT, UX3MZ, UR5TKM, US5UZ, UR5BV, AJ4FM, UR5ZRB, CU3HN, UT3RS, UA3IDM, W0AAA, UU8JX, UU4JM, ES1BA, 4X1IM, US2MM, US6ILF, US0LX, UT5JCE, RA3VFF, UY7IS, UR4SYM. Sufficient return postage ($3 or 3 IRC worldwide) send to Mr. Dwayne Lipscomb (KD4POJ) via PayPal at kd4poj@srt.com or by other way (see Contacts).